Gather together a vibrant group of textile artists, pose a problem that sparks their creativity, and you get “Masks: Disguise – Expose – Celebrate.” The bold and thought-provoking exhibition will be on display as part of the Fine Art of Fiber show opening at the Chicago Botanic Garden this Thursday evening. 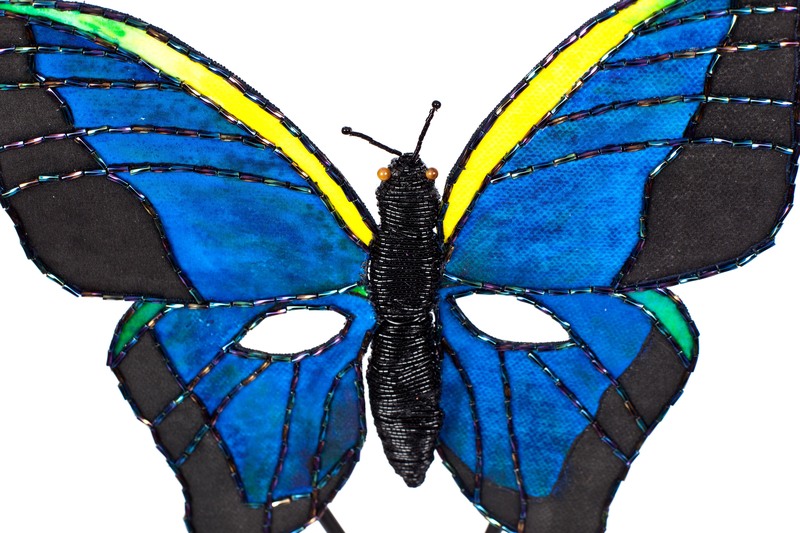 “Masks” is the 11th project by “Women’s Journeys in Fiber,” an ongoing exploration of the artistic process that began 16 years ago with an eclectic mix of quilters, lace makers, bead workers, weavers, and others. 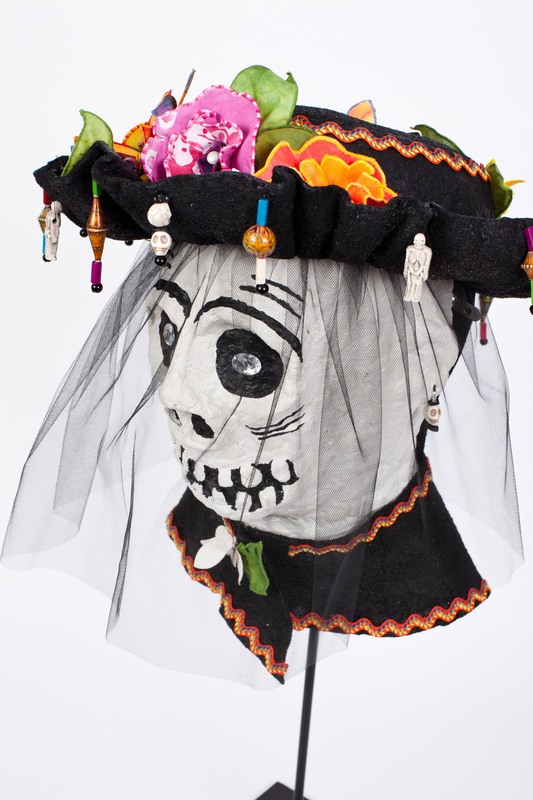 This year’s challenge: use a textile technique to construct a mask that’s celebratory, ceremonial, entertaining, theatrical, decorative, ethnic, or personal. It’s said that the spirits of the deceased can return to earth and visit their families on Dia de los Muertos (Day of the Dead). Images of skeletons, depicting the beloved activities of the departed, are used to welcome back the dead. 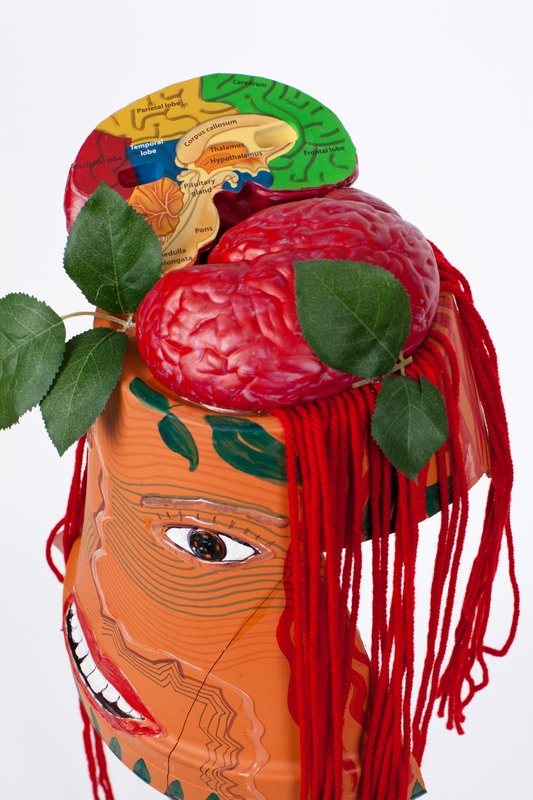 Perhaps the soul commemorated in Valerie Rodelli’s mask was a gardener, farmer, botanist, or nature lover. What have we gained and what have we lost in the Internet Age? Ma Bell Transformed reflects Mary Krebs Smith’s family traditions, as well as her frustrations with new modes of communication. Adornments to her mask include trinkets her mother and aunt received during their 45 years of service with Illinois Bell (AT&T). Do women really become invisible when they go gray? 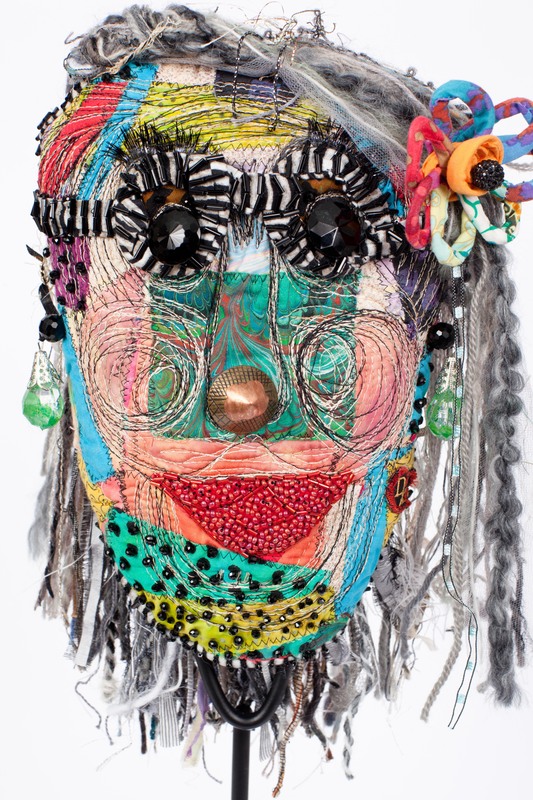 Dvorah Kaufman explored and ultimately rejected this notion in a playful mask, made with gray fiber donated by friends and family. “Women who have joy, energy, friends, and family in their lives will never become invisible,” Kaufman said. Virginia Reisner grew up on the northwest wide of Chicago near open spaces, where she played amid butterflies of all sizes and colors. “Things changed when a super highway was built through the area,” Reisner said. “Gone were the woods, the prairie and most importantly, the butterflies.” Her beaded mask pays tribute to “past, present, and, hopefully, future” winged beauties. Air, water, and earth are essential elements of nature that embrace all life. 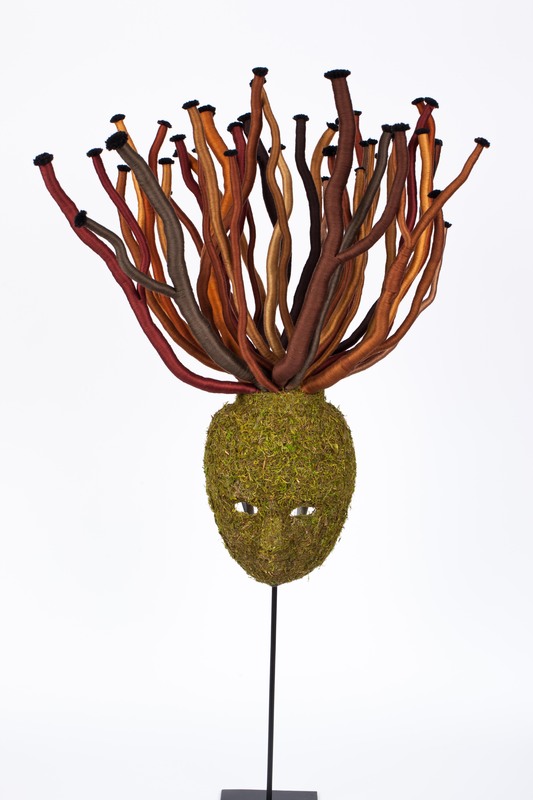 Hyangsook Cho’s mossy mask—sprouting wires wrapped with yarn—symbolizes the environment supporting all. 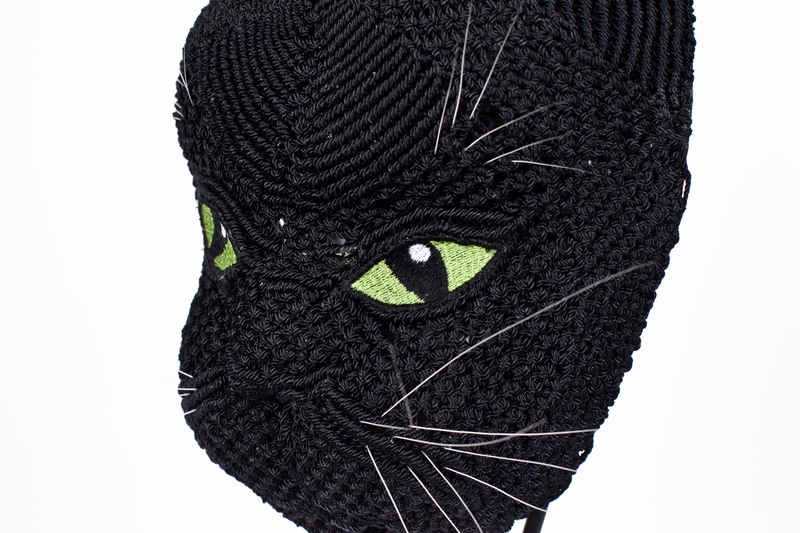 An exploration of macramé, incorporating real whiskers shed by pet cats, led to the creation of Marcia Lee Hartnell’s cat mask. Mental illness—a thread running through Maria Snyder’s family history—should be treated and discussed like any physical illness, she said. 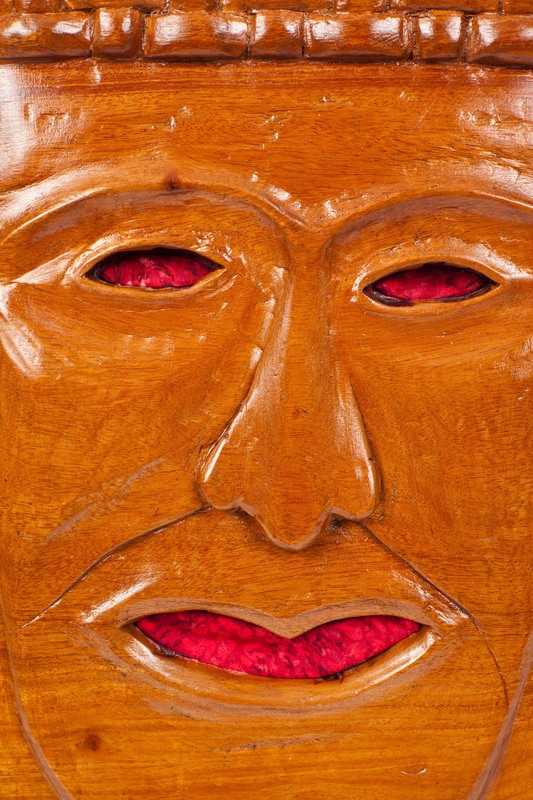 Snyder’s mask is a call to lift the stigma of mental illness and bring the topic into the open. 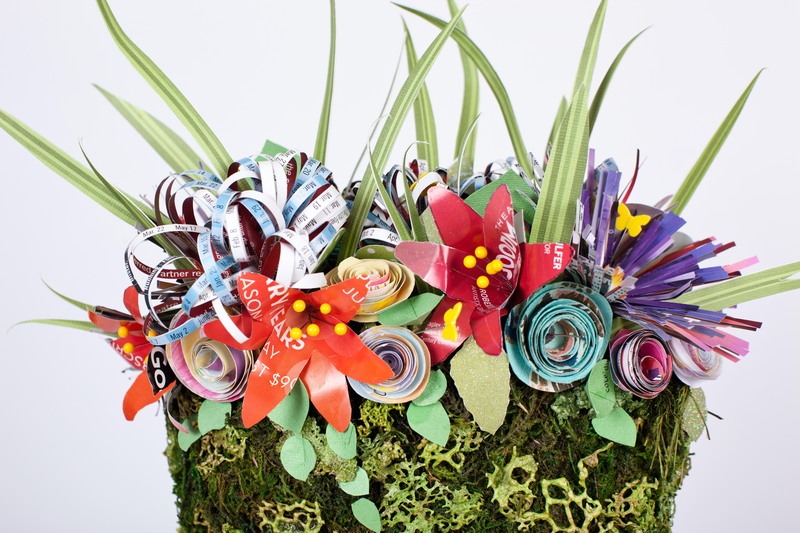 When Life Gives You Junk Mail, Create! A mailbox stuffed with colorful, abundant junk mail led Gretchen Alexander to ponder the debris generated and discarded by society. 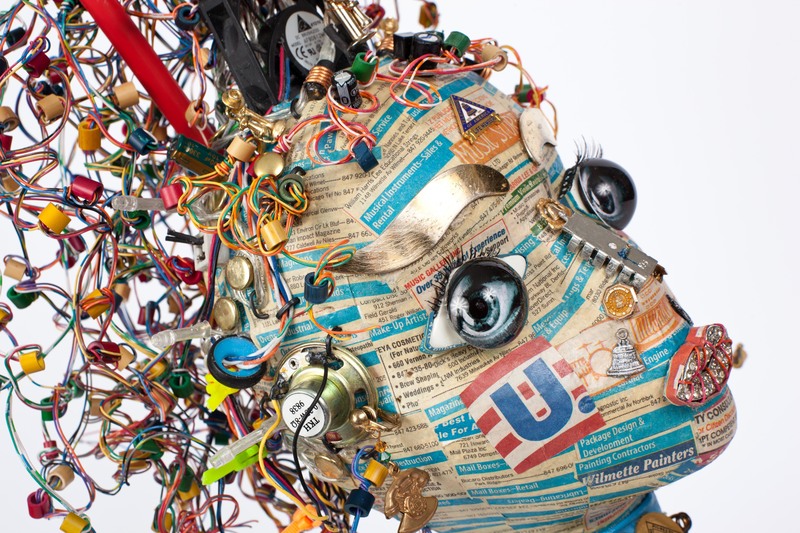 She created a mask from the overflow to serves as a metaphor for innovative ways to reuse and recycle materials. 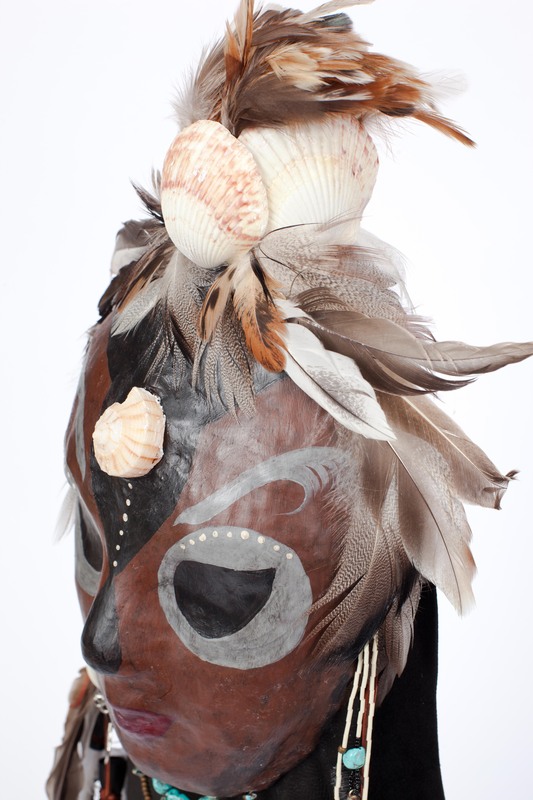 Western and Native American astrology, Hindu traditions, and a crown of seashells help express Cathy Mendola’s deep connection to nature in this interpretation of a Shaman spirit mask.